For the 1977 film, see Looking for Mr. Goodbar (film). 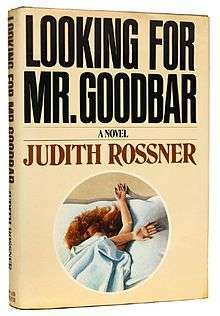 Looking for Mr. Goodbar is a 1975 novel by Judith Rossner. It is based on the events surrounding the 1973 murder of Roseann Quinn, a 28-year-old New York City schoolteacher. The fictional name of one of the drinking establishments featured in the book was Mr. Goodbar, due to a candy bar theme and the dual meaning "good bar" = "nice pub". Looking for Mr. Goodbar became a bestseller and spawned a 1977 film adaptation starring Diane Keaton and Richard Gere. ↑ Eisen Rinzler, Carol (June 8, 1975). "Looking for Mr. Goodbar". The New York Times. ↑ "Looking for Mr. Goodbar". Google Books. ↑ "Looking for Mr. Goodbar". The New York Times.